The EVOLUTION 100A is housed in a similar slim case with engraved front panel and solid metal control knobs as the EVOLUTION 50A. It uses the same ingenious soft push button design, offering excellent tactile feel and backlit optical indication of functions, for optimum user-friendliness. In addition to greatly increased performance, thanks to ingenious new circuit design, the EVOLUTION 100A has been equipped with 2 sets of high quality loudspeaker binding posts, with local and remote switching for A & B outputs. Optional extras include the ability to plug the (optional) Sequel mk2 Phono pre-amp inside and add the AMBIT FM/AM radio or RUBY DAC/Bluetooth/FM radio module to the expansion slot on the rear panel. After testing several methods of building a high performance and high efficiency power amplifier, suitable for this new model, David Gamble ­­ - Creek Audio's Senior Engineer - created a unique Class G circuit especially for the EVOLUTION 100A. The Pre-amp circuit provides high levels of flexibility and control, via unbalanced or balanced inputs. It has multiple input options, switched either electronically or by gold contact relays. Instead of the headphone output being sourced from the power amplifier, the headphone output is derived from a dedicated amplifier, with only a few Ohms in series for protection against short circuits. To simplify the many options a stylish system remote handset controls all the functions of the EVOLUTION 50 and 100 series. 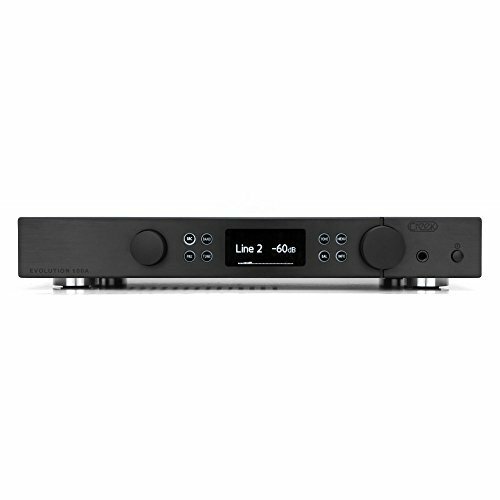 The EVOLUTION 100A provides stunning audio performance and is capable of out-performing other makes of amplifiers costing many times the price. Optional tuner (Ambit), DAC (Ruby) and phono modules available separately. If you have any questions about this product by Creek, contact us by completing and submitting the form below. If you are looking for a specif part number, please include it with your message.